Very professional! They handled my case and kept me informed throughout the whole process. I will make sure to refer all my friends. Very professional staff. I am very satisfied with my experience with my claim. Fast process and staff kept me up to date throughout the whole process. HIGHLY RECOMMEND. I receive my check in the mail today :). I'm so glad I choose them, the process went smoothly and professionally. I hope the brush fire doesn't happen anytime soon, but if it does , I know who to contact. I had the pleasure of working with Linet on several matters relating my families' personal legal issues. She shows the utmost courtesy and professionalism and helped me clearly understand some legal strategies. I felt at ease because she always let me know what was going on every step of the way and ensured the I understood things before moving on. I think having Linet as an attorney brings a peace of mind that one cannot afford to be without! Mrs. Megerdomian is a true professional. She explained the bankruptcy process clearly and completely and kept me up-to-date not only on progress, but also strategy. At all times her focus was on what was best for me and my family. Your advocate in the trials of life. We understand that every client is unique and that there are real stories and real lives behind each case. Whether you lost your job, got sick, are facing a foreclosure, or mounting credit card debt, we can help you get back on your feet. We strongly believe that accident victims are entitled to fair compensation for the trauma they have endured and will fight to ensure that you receive the compensation to which you are entitled. We fight on your behalf to get the payments you deserve to pay for cleanup, restoration, hotel expenses, and more. Linet Megerdomian grew up in Glendale, California, and now lives with her husband, Kevork, in Marina del Rey. 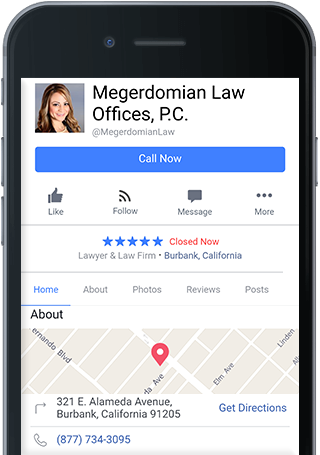 Linet began practicing law at a criminal defense and personal injury law firm in Beverly Hills followed by an insurance defense firm in Burbank. Her early practice instilled in her the ability to successfully represent both plaintiffs and defendants and provided her with extensive experience with a wide variety of legal matters, including litigation for plaintiffs and defendants, bankruptcy, business entity formation, and contract review and drafting.